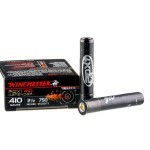 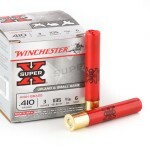 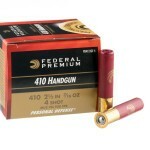 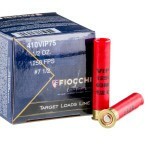 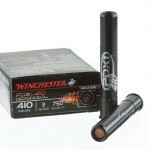 .410 bore shotshells are known for their low recoil and are often used by new shooters or, conversely, those seeking a challenge against small targets. 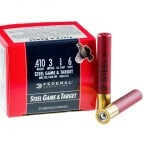 Introduced in the 19th century by British ammo manufacturer Eley, the .410 is named for the nominal diameter of the bore firing it; despite this, it is common for shooters to refer to "410 gauge." 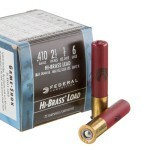 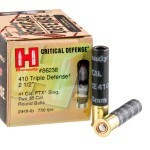 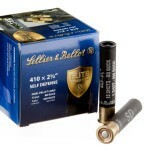 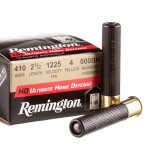 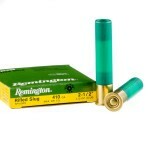 Unlike many other shells, .410 bore ammo usually comes in hull lengths of 2-1/2" and 3". 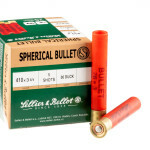 Shotguns in this gauge are typically designed for sporting use, while revolvers such as the S&W Governor and Taurus Judge can fire both .45 Colt cartridges and .410 bore shotshells and are intended as self-defense firearms. 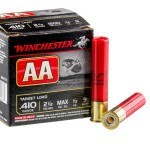 Certain survival rifles such as the M6 used by the United States Air Force also incorporated a .410 barrel. 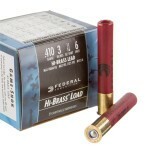 Typical uses for this gauge include target shooting and hunting; the small payload of the .410 means that it is not overly destructive to meat. 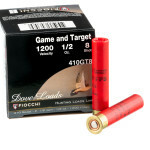 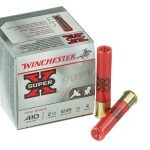 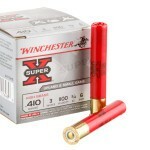 Shooters usually take animals such as squirrels and rabbits with the .410 bore, as the relatively small patterns thrown by the shell are not ideal for hitting birds reliably. 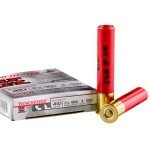 .410 ammo firing #6 to #9 shot is well suited to these purposes. 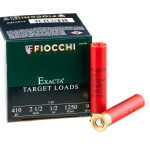 While most .410 loads are designed for sporting use and fire birdshot, a few fire relatively large projectiles and are intended for defensive use. 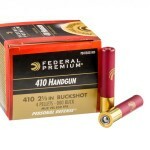 Examples of these types of .410 ammo include slugs from Remington and Hornady and a 000 buck load from Federal. 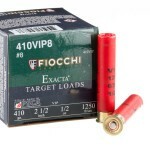 In this context, the .410's main advantage is the compactness of the weapon firing it, rather than the cartridge's power.